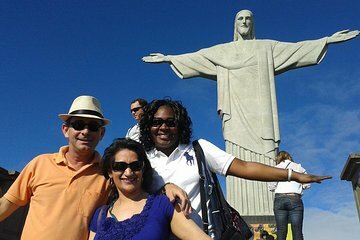 Gain an insider’s perspective of Rio de Janeiro on a half- or full-day of the vibrant Brazilian city with passionate local tour guide, Marcio Boechat. Embark on a guided tour of Rio de Janeiro’s arresting landmarks with Marcio, visiting the iconic Christ the Redeemer statue and admiring the grand façade of Metropolitan Cathedral. Allow Marcio to suggest the best spots to enjoy authentic Brazillian cusine and gain valuable insight into the city’s rich culture and history from a native local. Customize the duration and itinerary of this private tour according to your interests. Marcio was an excellent tour guide, we experienced a very enjoyable day. Our day started early so we could beat the crowds at Christ the Redeemer, which was an excellent idea of Marcio's. He has been a guide for many years and it shows in the little considerate things he does, like making sure we are in the best position to see things, taking very special photos of us and is conscious of our comfort at all times. As this was a private tour he was willing to go wherever we wanted so we could choose the places we had read about but also some recommendations from Marcio. I would highly recommend booking Marcio for any tour you would like to do. Marcio was the ideal guide for my first full day in Rio. He took the time to provide his extensive knowledge on every hot spot and even the hidden gems. Despite it being a cloudy day to see Christ the Redeemer, Marcio went the extra mile literally to take me to an extra location he knew I'd enjoy. He was funny, informative, full of energy and kept us moving along. Best of all, he was on time to pick me up and drop me off. He took the guesswork out of everything and made my stay at Rio even more memorable. Worth every penny. Obrigada, Marcio. Marcio is the best tour guide in Rio! Marcio picked us up at our apartment at 0715 to make sure we missed the crowds and spirited us away to Christ the Redeemer before all the crowds started to spoil our pictures. he knows everything, is charming, funny, perfect English and is extremely flexible if/when he has to adjust your itinerary for whatever reason. I cannot recommend Marcio highly enough and the tour itself ensures you get to see places you could not discover on your own and it would take you at least two days to cover the ground we did.